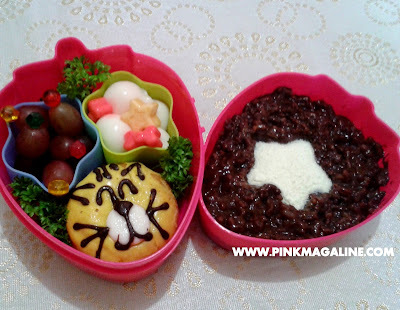 I was supposed to put chocolate pudding bento as title of this blog entry, changed my mind after noticing that everything I prepared were all sweet. You know, I always make sure that my elder daughter gets a balanced school snack, so I surprised myself with this one. I am sure I did this unconsciously while in a rush. I mean, why would I want Askim to get all sweets? That's not me, not at all. 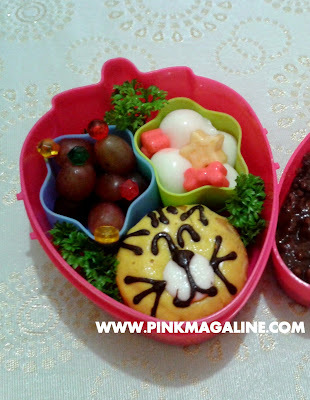 Still sharing it, though.. my not so healthy snack bento. I didn't use evaporated milk for the champorado to avoil a spill. PS. Sorry for the bad quality of photos. When preparing my gradeschooler's school under time pressure, I don't mind bringing out my EOS 60D anymore and I just use my cameraphone to take photos, sometimes my Sony Cybershot. Champorado as baon sounds like a really great idea!!! Now I miss champorado cooked in native tsokolate, I miss Pinas.